Goal — In the spring/summer 2008 issue of Checkerspot, two former Montrealers share the trials and rewards of building their dream mountainside eco-home. Of course, not all of us can build a house on a mountain, but there's nothing stopping us from imagining what our ideal green home might look like. After all, every good greening project begins with an idea and every perfect home starts out as a dream. Most real estate agents will tell you to start by deciding where you want to live. How far will you be from work? Are friends and family near by? If you have kids, schools in the neighbourhood are important. When you throw in the green element, the location of your home takes on added importance. If you picture yourself living downtown, figure out what locations have good access to public transit and amenities and which neighbourhoods are pedestrian- and bicycle-friendly. If your home is well-located, you may be able to live virtually car-free earning you major points on the green balance sheet (and the money you'll save on gas could go towards those solar panels you've had your eye on). If a suburban or rural lot is more your style, remember to factor in your transportation emissions. If you're building from the ground up, find out what ecological value your land is currently providing and try to minimize the clearing done to make way for your house. If you have some space to grow vegetables and herbs in your yard, you can cut back on the emissions associated with transporting foods from long distances and hopefully save a few trips to the grocery store. Once you've figured out where you want to live, start picturing the design of your perfect home. How you envision your dream green home has to take into account not only environmental sustainability but also your own needs and desires. After all, a true dream home is one you'll want to stay in for a long time! Ask yourself what kind of home you need and what features you want. Could you live in a high-rise condo, or is a detached home with a sprawling yard a requirement? 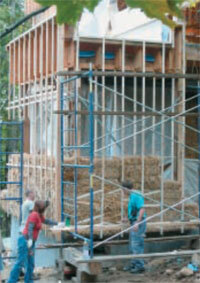 Remember, you don't necessarily have to start from scratch to have a green home. Buying an existing home saves the energy and raw materials required for a new construction and there could be some simple renovations you can make to improve the efficiency of your dwelling. Keeping the size of your home in check is a starting point for reducing your footprint. Start brainstorming ways to improve the energy efficiency of the home you choose, since having a home that consumes less energy is key to green living. Ponder how to maximize the insulating qualities of your home and how you might incorporate renewable energy supplies like passive solar heating or small-scale wind turbines. Think low-energy appliances, compact fluorescent lighting, double-pane windows, a high-efficiency furnace and a tankless hot water heater. Imagine yourself lounging in a yard with some gorgeous, native deciduous trees sheltering your house on the west and south facing walls. Whether you're building a new home or adding some green features to an existing home, factor in the impact of the materials you choose on the climate and the environment as a whole. Everything from the wood, to the glass, to the carpets, to the insulation should be considered. Make sure your contractor uses only Forest Stewardship Council-approved lumber and employs techniques that minimize waste. Choose durable products that don't need to be replaced frequently, such as long-lasting roofing materials. Go for reclaimed materials like flooring and millwork. When choosing products like materials for your deck, ceramic or glass tiles or counters and carpeting, look for a high recycled content. Picture flooring made from quickly-renewable sources like cork or bamboo. One simple way to up the green quotient of your home is to find ways to conserve water. Low-flow toilets, grey water systems and methods of collecting rainwater for your garden are all easy upgrades. Results & Impacts — Not to put too fine a point on it, but owning a green home can fatten your pocketbook. United States-based organization, Build It Green, says that environmentally friendly building strategies can reduce maintenance and replacement costs, cut utility bills and increase property and resale value. And let's face it; when you're fantasizing about your perfect home, dollar signs will eventually enter the picture.